uhm...damn my eyes went straight to the phallic bat man and my mind went straight into the gutter. does that make me a pervert? i feel so mortal now and so exposed. damn you piraro, damn you. And I am DATABOY! One word. For now. Until I expand my operations and become Da Taboy! Hmmm., I better re-think that! And bless you Piraro, from boyz everywhere. Surely there's gotta be someone out there (Borscht Belt?) with the last name Batman -- but with the "man" prounounced more like it is in Goodman. Between the trademark lawsuits and midnight calls from Gotham City, the poor guy probably never gets any sleep. Love the art car. What kind of mileage does that baby get? 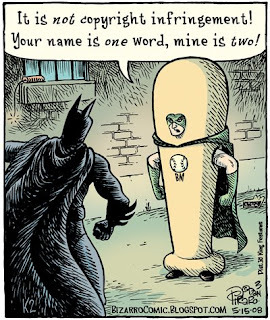 No comments about the phallic nature of Bat Man's costume eh? It's no wonder; because with an outfit like that, it's doubtful he could make it to first base. As least the costume only has one image of a ball. Btw, the lawyer's probably wrong. You can trademark the same word for distinctly different concepts or businesses. Tell him to check USPTO.gov, lol.